I can’t stop drinking hot chocolate lately. Not surprising, given how it is outside. All I want to do is curl up in a blanket and go to sleep until this horrid winter lets up. If only life would allow it :). On Sunday I had cup from Starbuck’s that was too chocolate syrupy for my taste. On Tuesday, one from Civilization which I was sure would be delicious as I saw it named one of 50 Things to Eat and Drink in Cleveland. The shop was adorable but the drink nothing special. And on Wednesday, Godiva’s costly version – delightfully chocolaty but only semi-warm. In case you are wondering, my Tour de Chocolat Chaud has not yet caused weight gain, although I fear it might if I don’t find a truly satisfying cup soon! Memories tell me nothing can beat Lilly’s drinking chocolate and that might have to be my next stop. 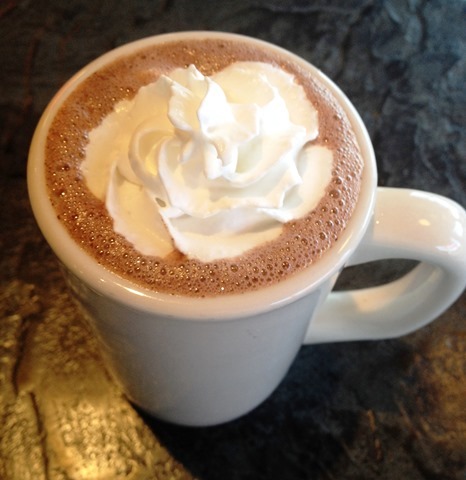 What’s your pick for the best hot chocolate in CLE? Someone help. Not sure how much longer you’ll be working downtown, but Phoenix Coffee on E. 9 has the BEST Mexican Hot Chocolate. I’m going through withdrawals down in Columbus, nothing else compares! Oh goodness, how did I not know this! I go there all the time for regular old coffee. Thanks for the tip! I am also going through a hot chocolate obsession. Hands down, the best recipe ever is the one on the back of the hershey’s cocoa box. Don’t forget the whipped cream. Enjoy my dear. Ah see sometimes a classic is best! Thanks for the advice :). i’m tempted to run out to Erie Island now and try their hot chocolate. I’ve never had it but all their drinks are so yummy. Lily’s is the best in my opinion – spicy peanut butter FTW!